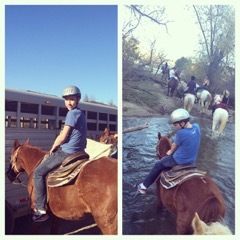 GallopNYC brings the proven benefits of therapeutic horsemanship to children and adults with disabilities in NYC. Through weekly riding sessions with PATH-certified instructors, we help riders walk, talk, connect, focus, behave, and learn, encouraging each one to live life as fully, productively, and independently as possible. Click here for website. 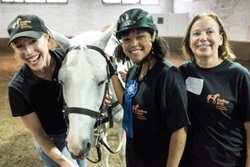 ​In Therapeutic Riding lessons, under the direction of a PATH Int’l -certified riding instructor, GallopNYC riders learn to sit their horses properly, use their reins to command the horse, and ride at a walk and trot. The horse is led by a trained volunteer and two trained volunteers walk alongside. ​​In Hippotherapy, a licensed physical therapist works with each child while the child is riding. The therapist is trained in using a horse as a physical therapy tool. 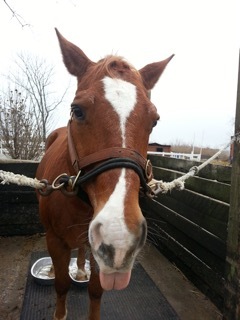 The therapists work independently with GallopNYC’s assistance. Provides an opportunity for mental health professionals and counselors to work with GalllopNYC to offer animal therapy to their clients. The capable handling of horses requires responsibility, leadership, and trust. GallopNYC’s Leadership Program helps develop these skills in team-building work with horses. Through the exploration of non-verbal communication with horses, GallopNYC’s Leadership Program will help executives and their teams better understand leadership and team dynamics. A leadership program for war veterans with visible and/or invisible injuries, designed to build competence, confidence and leadership.